Napoleon Bonaparte once wisely stated that an army marches on its stomach, and if he expanded on this premise then the navy only sailed with its daily ration of rum. This was particularly true of the British fleet where officers may have preferred a drop of brandy, but the lower ranks received their daily tot of rum to help them navigate the daily experience of life at sea. Prior to 1824, the daily measure was half a pint, and tales of drunken abandon on the high seas were commonplace. The Admiralty took action by halving the measure to a quarter pint, and dousing the flames of mutiny by adding 2 shillings to the monthly wage. Any dissatisfaction was short-lived the unit of measurement was changed shortly afterwards and in essence, the daily allocation rose again. The navy and rum are now historical associations that now live on the shelf of your supermarket – including this Wood’s Old Navy Rum, which is distilled at the Diamond distillery in the South American country of Guyana. Formerly a Dutch colony, before the British muscled in during the 18th century, Guyana is well known for producing a heavy and fruity style of rum partially thanks to the prominence of its sugar cane harvested from the banks of the Demerara river. The Diamond distillery itself was established in 1670, and today produces in excess of 26 million litres annually that is sold onto brand owners such as William Grant & Sons. This Scottish family-owned company is more widely known for its whisky with distilleries such as Balvenie and Glenfiddich. In the early 2000s, it diversified its portfolio purchasing rum brands Vat 19, Old Vatted Demerara and or course Wood’s Old Navy. 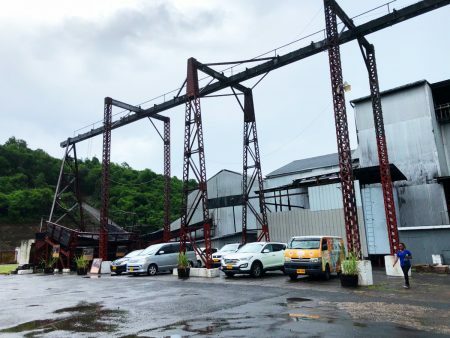 The Diamond distillery has benefited from the cull of smaller distilleries across Guyana – a trend we see throughout the rum world – as larger distilleries prosper at the expense of others. By doing so it’s built up a collection of stills including British Coffey and French Savalle style exponents. However, it’s famously known for still using the last remaining wooden stills made from the local hardwood called Greenheart. These are the last wooden stills in existence and Diamond has 3 types still in use today; a Port Mourant double type, a Versailles single pot still and an Enmore wooden coffee still. The Mourant can trace its roots back to a Guyanan distillery from 1732 and its design promotes a larger degree of reflux. Through the process of distillation, it creates a heavier oily rum that is more indicative of the historical Navy style. The still is an important part of the Wood’s, Pusser’s and the El Dorado rums we see today. 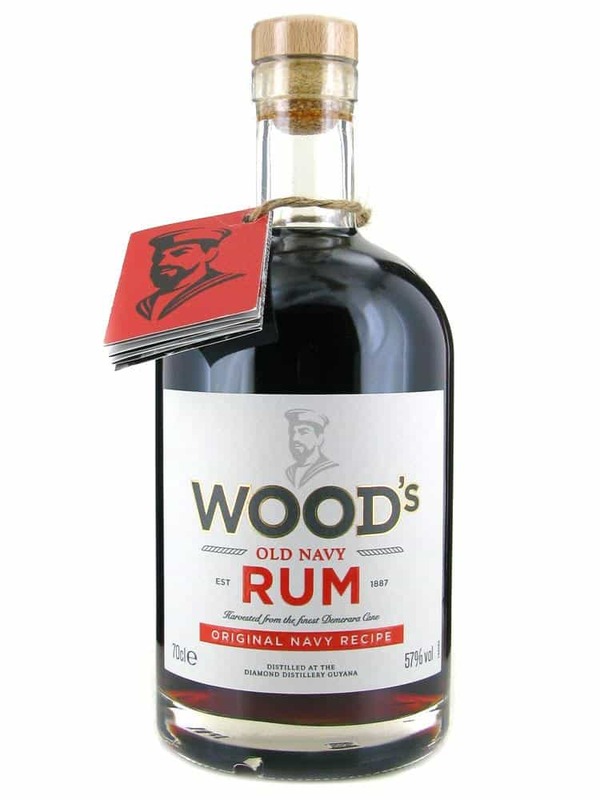 The Wood’s Navy brand itself dates back to 1887 and its current guise was revamped in 2016, with the rum being distilled from black strap molasses. It’s a blend of sorts and at least 3 years maturing in oak with some of the casks thereafter arguably helping to create the Balvenie Caribbean whisky. Wood’s rum is bottled at an impressive 57% strength and will set you back in the region of £25 suggesting you’re receiving more rum and a kick compared to its shelf neighbours. Time then to set sail with our tot of rum! On the nose: let’s get that get that Demerara sugar elephant out of the room right away. There’s an evident rawness matched by a herbal element and celery of all things. Dark chocolate, vanilla and sticky figs with just a tinge of alcohol. 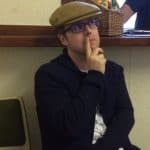 There’s a persistent earthy beetroot and memories of my granny’s coal bunker. The richness continues with liquorice and treacle with water revealing coffee beans, tobacco and cloves. In the mouth: it’s sweeter than the nose suggested with a sugary zing laced with treacle. More of that liquorice and chocolate before all-spice appears on the scene. Demerara sugar yes, accompanied by raisins (especially with water), vanilla and a tasty burnt/roasted dynamic. An excellent rum with a real emphasis on bold macho flavours, but there are a few layers of subtle characteristics that go beyond many rival supermarket offerings. On the palate, it may display its limitations and youthfulness to a certain degree yet this is definitely a go-to bottle for those seeking more from a rum that won’t break the bank.